Travels in search of the merely exotic. 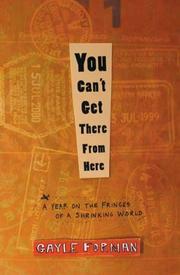 Debut author Forman, well known to readers of Seventeen, takes a teenager’s delight in casting herself as an outcast, a “Weird Girl” whose journeys tend to involve adoption by immigrant florists or drag queens or street performers, and who has thus seen several countries from perspectives generally denied the casual tourist. When she and her husband decide to spend a year wandering from one remote outpost to another in the wake of 9/11, the two—accompanied, sad to say, by big-wheeled suitcases to which they’d given names—naturally drift into some unusual circles. In Tonga, for instance (which Forman inaccurately describes as “rarely visited by tourists,” even though in the year of her visit there was one tourist for every three natives), she spends time among “fakaleiti, a strange third gender of half-men, half-women” who apparently fit right into Tongan society until the arrival of “American-style religious fundamentalism.” Presto: thanks to the Mormons, Tongans now know that they’re out of touch with the civilized world. Just so, in Beijing a doctor collars her into correcting an English phrasebook he’s been writing, even though he doesn’t know much English (sample phrase: “Is this the file you desired?” “Not that file, you retard”); the doctor’s lack of sophistication, Forman writes, will cost him, for whereas by her account Chinese don’t much care about the niceties of grammar, they do care about what it means to be an American, just as Tanzanian teenagers have made a near-Derridaean study of the collected works of Vanilla Ice. Forman writes breezily and pleasantly, though some of her set pieces go on too long and run out of steam. Her book, too, could have benefited from a more closely followed overarching theme of the kind that Franklin Foer worked so effectively in his globalism-dissecting How Soccer Explains the World (2004), which makes many of the same points. A mixed bag, then, of some interest to armchair travelers, if not to Weird Girls everywhere.